In October of 1992, Ethan Posen, president of The $1 Store Plus and Only Deals® and the late Edward Posen successfully launched The $1 Store Plus in Winnipeg. The store was an immediate success and soon after, Ethan and Edward began opening franchise stores across Canada. 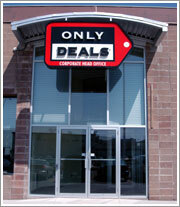 Today, as a national chain, these retail stores stretch from Victoria, British Columbia to St. John's, Newfoundland. Our retail experience, demographic studies, market evaluations and most of all, Ethan's passion for retailing, have led this company to become one of the most dynamic and innovative retailers in Canada.